Emily Deschanel at the 2012 Comic-Con in San Diego. Emily Deschanel is an American actress. She is best known for her role in the TV series "Bones". She has been nominated for 4 People's Choice Awards and 3 Teen Choice Awards. She is the daughter of 5-time Oscar nominee and cinematographer Caleb Deschanel and actress Mary Jo Deschanel. 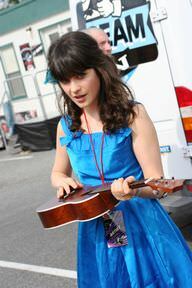 Actress and musician Zooey Deschanel is her sister. She is of French, Swiss, Dutch and English descent. She has a Bachelor of Fine Arts in Theater from Boston University. She is married to actor and writer David Hornsby and they have 2 children. She is a vegan. Actress Emily Deschanel at 23rd Genesis Awards - Beverly Hills, California. Emily Deschanel is a famous American actress, who was born on October 11, 1976. As a person born on this date, Emily Deschanel is listed in our database as the 4th most popular celebrity for the day (October 11) and the 13th most popular for the year (1976). People born on October 11 fall under the Zodiac sign of Libra, the Scales. Emily Deschanel is the 60th most popular Libra. Aside from information specific to Emily Deschanel's birthday, Emily Deschanel is the 434th most famous American and ranks 495th in famous people born in Los Angeles, California, U.S. In general, Emily Deschanel ranks as the 739th most popular famous person, and the 151st most popular actress of all time. “The Famous Birthdays” catalogs over 25,000 famous people, everyone from actors to singers to scientists to serial killers and more. If you're curious to see who was born on your birthday, you can use our database to find out who, what, where, when and why. You can search by birthday, birthplace, claim to fame or any other information by typing in the search box, or simply browse our site by selecting the month, the day, the horoscope, or any other clickable option. 495th born in Los Angeles, California, U.S.